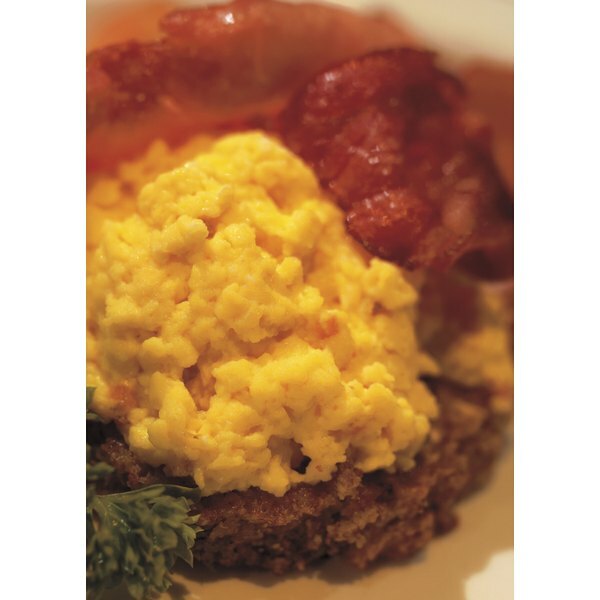 Serve scrambled eggs with bacon or sausage. 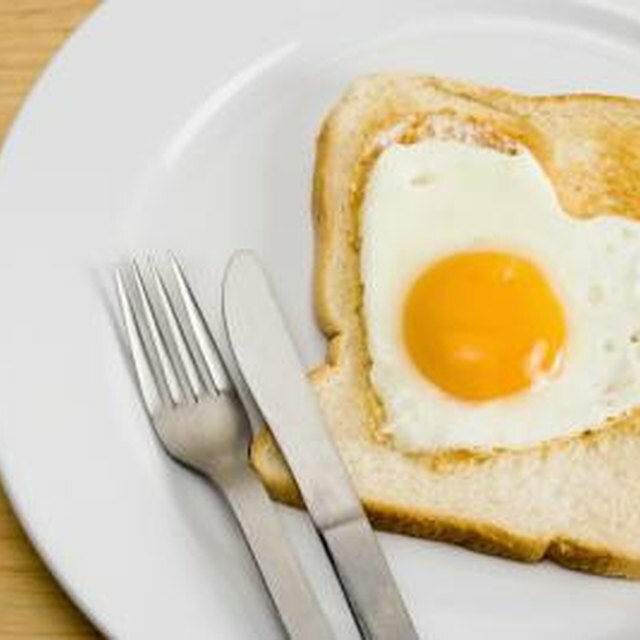 Most world cultures eat eggs at some point during the day, be it for breakfast, lunch or dinner. Although touted as one of the simplest foods to make, eggs often vex cooks because of their complex chemical makeup. To cook perfect, or near perfect scrambled eggs, you must pay close attention to time, ingredients and heat intensity. Because serving undercooked eggs can cause foodborne illness, you should use a food thermometer if you are unsure when eggs are done. Crack the eggs into a mixing bowl. Use three eggs for a single serving, or use more for multiple servings. Add salt and pepper to taste. Whip the eggs with you whisk until the whites and the yolks are blended thoroughly. Add a little bit of water, which makes the eggs light and fluffy when cooked, and whisk the eggs for a few more seconds. Set your stove to medium heat and add butter to the frying pan. Bring the butter to a bubble, spreading it around the pan to cover the surface. Monitor the heat so that the butter does not burn in the frying pan before you pour in the eggs. Pour the egg mixture into the frying pan. Immediately start pulling the eggs from the outer edge to the center of the frying pan, forming chucks. Add a handful of grated cheese to the partially cooked scrambled eggs. If you are adventurous, you can add other ingredients as well. Fold the cheese into the eggs by turning the cooked eggs on top of the cheese. Turn off the stove and remove the eggs from the frying pan as soon as they are firm, meaning as soon as all the runny spots are cooked. Use your food thermometer to confirm that the cooked eggs have reached at least 160 degrees Fahrenheit, USDA's recommended cooking temperature for safe egg consumption, before serving. Post the USDA's Internal Cooking Temperatures food safety fact sheet in your kitchen for quick reference.